Sorry. No thermodynamic free energy. All existing energy is evenly distributed. No work can be done because there are no energy gradients. All matter has decayed via the slow evaporation of black holes. My bad for being glib and imprecise. Ah, all good then, we are definitely on the same page. Well that's the most wonderful part. The universe could exist in complete thermodynamic equilibrium for trillions of years until such a fluctuation occurs and... a whole new universe of matter and energy starts to expand! ETA: It should be added that we don't know that this is what's going to happen. Scientists are pretty sure that our universe will end in a heat death, but the idea of a new universe emerging from quantum fluctuations out of such a state, while largely consistent with what we do know, is at this time pretty much entirely speculative. Last edited by arthwollipot; 9th January 2019 at 07:06 PM. The real problem is that such a universe would be very unlikely to look like ours, yet everything we know at present leads to the far future universe undergoing such a thermal fluctuation. There is some work being done in how to avoid such thermal fluctuations, but that is, as you say, speculative. (note that it is a thermal not quantum fluctuation that we're talking about). A Giraffe's neck is to short to allow it's mouth to reach the ground so unlike most other 4 legged mammals it has to splay it's legs in order to drink. Yes, I saw that on QI as well. So I say catsmate is indeed correct. EDIT: Forgot to add that it would be correct also for a sphere. The height of cylinder and cone have to be doubled, so all volumes are doubled and hence the ratios stay the same. Last edited by TheGnome; 9th January 2019 at 11:54 PM. Erm. Well, I'm pretty sure it will burn up. Blubber is a good insulator, but it's not that good. That's exactly what wiki tells us. The similarity of appearance is an oft-cited example of "convergent evolution". it wasn't in an orbit - it just materializes above the earth alongside a bowl of petunias. Above "an alien planet". There may or may not have been an atmosphere. And hey, what’s about this whistling roaring sound going past what I’m suddenly going to call my head? Last edited by MetalPig; 10th January 2019 at 04:03 AM. Your brain just cannot grasp it. In short, set a timer for 52! seconds. Walk slowly around the equator taking a step every billion years. After each round trip remove a drop of water from the pacific ocean. When the ocean is dry, put a sheet of paper on the ground. Fill the ocean up again, empty it again and add another sheet of paper. When the stack is as high as the distance from the earth to the sun, look at the timer. 806381751709438785716606368564037669752895054408832778 24000000000000 seconds remaining... and counting. Carry on as above but remove the stack again, a page at a time. Start over, do it again. You only have time to do it about 3000 times. Last edited by Cheetah; 10th January 2019 at 05:26 AM. I'm getting only about 1200 times. I'm guessing you're using thin paper and not taking bathroom breaks. Given that the planet is Magrathea and Arthur, Ford and co land on it and go for a walk, I think there's an atmosphere. How can a sphere and a hemisphere be of the same dimensions? Except in the original example, IIRC, it was about BASE diameter, which for a sphere is zero. Slight derail, but when it comes to numbers that can't be grasped, I occasionally read the Wikipedia page on Graham's Number just to have my mind boggled by it's enormousness. I genuinely think my brain goes up to about 100, or maybe 1000, after that it's just 'lots'. That's not to say I can't work with really big numbers, I just don't think my brain can really conceptualise them. Last edited by 3point14; 10th January 2019 at 09:11 AM. Yes, of course. Someone above was trying to say that it should have been a sphere, not a hemisphere, when the original example was about volumes relative to base diameter. My first thought was, "Do I get to take a break every thousand years to go sharpen my beak?" Note the heights of cone and cylinder are h=2*r, as is the "height" of the sphere. I could not find an illustration with a hemisphere but it's simple to visualize, starting from the above. The important thing is that the heights are now only h=1*r.
That's a million beak-breaks for every step you take, so no. Yeah, I'm that kind of hard-driving boss. 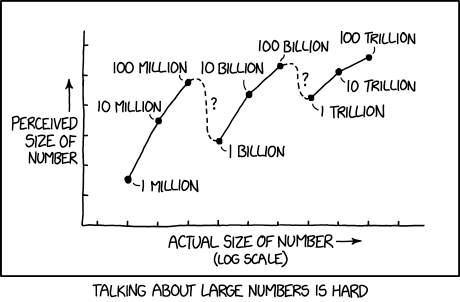 Surpassed, however, by the XKCD Number (in panel 3). Well said This is The End. A perfect ellipse is possible as a concept if it is symmetrical about it's long axis but as you note it does not exist in nature. I know I won't get much mileage out of this with the religious who like to hang the word "perfect" on all kinds of things. The result? If you take the entire human population that has ever lived and compute the amount of neutrinos passing through them over their entire lifetime, you would have approximately 0.15 grams of mass. I understood several of the words on that page. Balancing the matter-energy equation say it again! Using that picture, it makes sense that a sphere OR a hemisphere would work, but not both in the same cylinder, because for a hemisphere, the distance from the bottom to the top of the cylinder would be the radius of the hemisphere, while the cylinder base would be the diameter of the sphere / hemisphere. So the sphere and hemisphere would have the same diameter to the edge of the cylinder, but top to bottom of the cylinder the diameter of the sphere = radius of the hemiphere, so the sphere would be flattish, footballish.